During the early 1900's Ten Mile was a mile post for the Pacific Great Eastern Railway. Relocation was necessary because of the potential difficulties in crossing the Cottonwood River but today there is still evidence of this abandoned railway in the Park. Ten Mile Lake Provincial Park is situated in the Fraser Basin, encompassing 241 hectares on the east shore of Ten Mile Lake. With it's rolling hills, shallow lakes and vast climatic transition zone, dry to the west and wet to the east, this park makes for an interesting array of landscapes. Trees and shrubs are plentiful including white spruce, lodgepole pine, trembling aspen, red-osier dogwood, falsebox and soopollalie. This Park is located 11 kilometres north of Quesnel on the Cariboo's Gold Rush Trail, Highway 97. The Beaver Pond Trail is a 2 kilometre trail leading through the park's different landscapes and along an abandoned rail road. After the Ice Age the massive glaciers shaved the basalt rock into finer materials. Here on the trail you will encounter cutbanks showing thick layers of fine clay and silt, lava and layers of organic soil composed of rotting leaves, bark, plants and animals. You will also see where nature's own architects have built a fifteen metre long and five metre high dam. You may even be lucky enough to find them doing repairs! Also keep your eyes open for the many species of birds and water fowl living here. In the winter the parks trails are transformed into approximately 10 km of cross country ski trails. 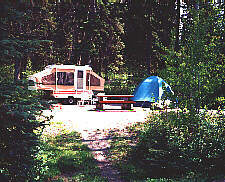 Camping - This park offers vehicle accessible campsites. There are two large campground areas in the park, known as Lakeside and Touring. Campsite reservations are accepted at the Lakeside Campground and first-come, first-served sites are also available. 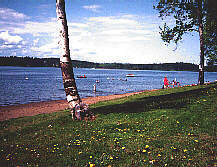 The Lakeside campground consists of 60 sites, 6 of which are double sites. The Touring campground consists of 46 sites. There are a variety of shaded, treed, and open sites and extra parking available at each campground. The gate to the park is locked between 11:00pm and 7:00am. Only registered campers are allowed in the campground after 11:00pm and quiet time is between 10:00pm and 7:00am. Day use facilities - This park has a day-use/picnic area. Picnic tables, fire pits, pit toilets, a covered shelter, three long sandy beaches and change-houses are all located at the day-use area. There are also picnic tables and a wood stove in the shelter. Firewood is not provided in the day-use area so people need to bring their own. 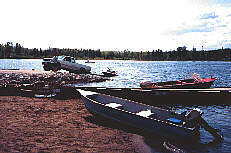 Boating and Fishing - A boat launching ramp is accessed beside the Lakeside Campground entrance. Water skiing and canoeing are popular water activities at Ten Mile. The rainbow trout is abundant in the lake. Try your luck in the spring or in the evening throughout the summer.